The project has been carried out as a randomized controlled trial with 6,800 volunteer cyclists. After random selection, half of the group – the test group – got the bicycle jacket at once and promised to wear it each time they biked during a year. The other half of the group composed a control group that got the bicycle jacket after the closing of the project, i.e. after a year. The safety effect of the bicycle jacket was analysed by comparing the number of self-reported accident for the test and control group. The self-reported accidents showed that the test group had 38% fewer personal injury accidents with other road users – so-called multi-party accidents – than the group who did not wear the bicycle jacket. If one only looks at accidents between participants and vehicles, the difference is 48%. The differences are statistically significant at 5% level. In the test group, 37% of the involved parties in an accident reported that they were not wearing the bicycle jacket or any other bright-coloured garment when the accident occurred. We've been lucky to have some great December riding weather the past several days. Today we were biking some errands and we were pleasantly surprised to see two inverted U racks at the Tysons Bed Bath & Beyond store on Chain Bridge Rd at Boone Blvd. The racks are placed near the entrance, take up very little space, and are installed correctly. This almost never happens so it's a big deal when we see good examples like this. Kudos to BB&B. Any day now the county will have official bike parking guidelines. We've been told that the draft guidelines that have been under development for several years will go before the Board of Supervisors in February or March. The Town of Vienna requests language to be added to specifically include "new sidewalk projects" as eligible for HB 2313 funding. An expanded sidewalk network provides transportation options and reduces motorized vehicle use and congestion. The Town and Fairfax County are receiving considerable transportation funding based on HB 2313 and it's important that pedestrian and bicycle projects be eligible for that funding. Fairfax County has determined that most of their ped/bike projects do not qualify for those funds. We're pleased that Vienna thinks that sidewalk projects are a critical part of their transportation network. It's unfortunate that their request didn't include bike projects. Also included in the legislative agenda is Vienna's support for "a change to the composition of the Commonwealth Transportation Board to have greater representation to the urban/dense suburban areas of the Commonwealth." The CTB plays a significant role in determining which VA projects receive funding and as Virginia's urban areas grow it's important that those areas are well-represented on the CTB. Virginia Bicycling Federation is developing their legislative agenda but the information has not been made public. We assume it will include topics such as dooring, following too closely, and motorists stopping for bicyclists in a crosswalk. We hope their agenda is published soon. The Board of Supervisors included the crosswalk bill in Fairfax County's legislative agenda along with a statement regarding the need for multimodal transportation options in growing employment centers: "That transformation has already begun in Tysons, where significant improvements in transit access have been made, but additional resources are needed to ensure that pedestrian, bicycle, and transit modes thrive and roadway congestion is addressed." The Bicycle Master Plan was adopted by the Board of Supervisors on October 28. The final Bicycle Master Plan text and recommended route map were recently posted by the county. Changes were made to the draft text and maps after the Planning Commission and Board hearings, and those changes are now included in the plan. To distinguish it from earlier copies, the cover of the final plan has a date of October 2014. Unfortunately there is no redlined version to easily find changes made during the PC and BOS adoption process. 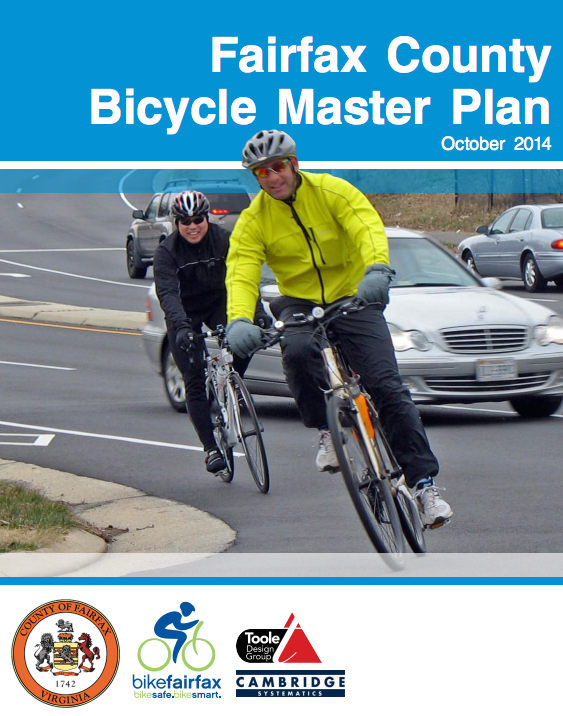 We expect the plan and map to be posted on the Bicycle Program Bicycle Master Plan site in the near future. They are now posted on the Recently Adopted Comprehensive Plan Amendments section of the planning and zoning site but will likely not be there for long. FABB has requested several printed copies of the plan text. We'll be referring to the plan often in the years to come. A FABB member recently attended a webinar on Complete Streets in the South sponsored by the Safe Routes to School National Partnership. One of the cities featured is Memphis, Tennessee, which in 2008 and 2010 made the list of Bicycling's Worst Cities. Since then the Mayor has committed to adding 55 miles of new bike lanes and hired the city's first bike coordinator. Bicycling recently featured Memphis in the brief article America's Most Improved Bike City. The city now has a Complete Streets Manual that is helping transform the city into a more bike- and ped-friendly place. Another great Complete Streets resource is Rethinking Streets: An Evidence-Based Guide to 25 Complete Streets Transformations. It contains some excellent ideas for remaking our streets into safer, more bike-friendly places. 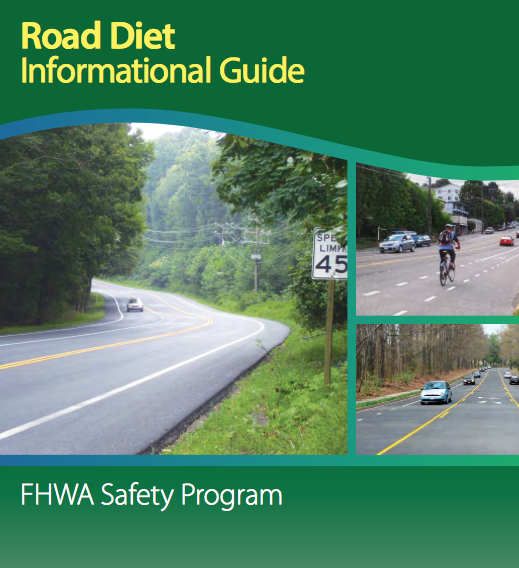 Several of the transformations consist of road diets similar to those in Reston on Lawyers Road and Soapstone Drive that are featured in a new Federal publication, the Road Diet Informational Guide. MWCOG conducted a survey of local jurisdictions to determine which had Complete Streets, Survey Finds Number of Local "Complete Streets" Policies in the Region Growing. According to the survey, Fairfax County said they have a Complete Streets policy, the Transportation Policy Plan. Join the Reston Pedestrian and Bicycling Committee for a tour of holiday lights in Reston on Saturday, Dec. 20. The ride begins at 4:30 p.m. at Lake Anne Plaza. The route is not flat. 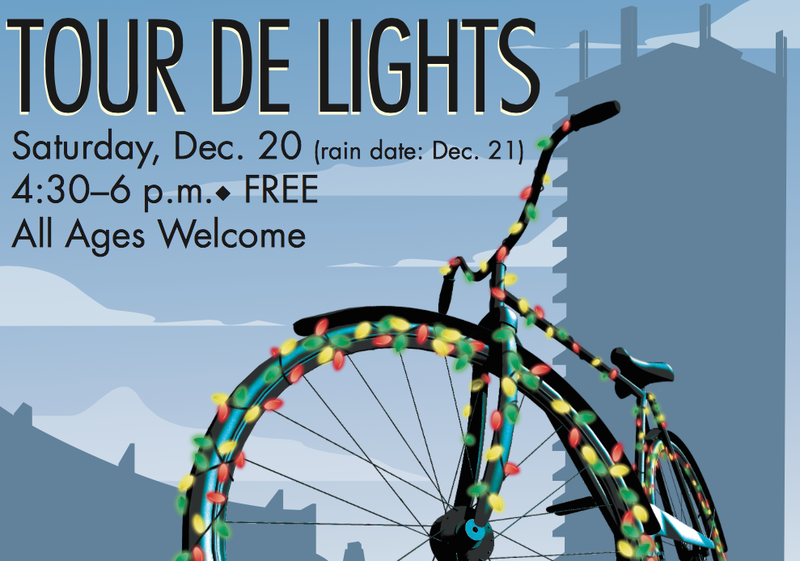 For more details see the Tour de Lights poster or send a message to pbac@reston.org. One community where a road diet was a good fit is Reston, Virginia, where two roads recently shrank, and motorists, bicyclists, and pedestrians are safer for it. In Reston, the Virginia Department of Transportation (VDOT) implemented a road diet on a two-mile segment of Lawyers Road during an already scheduled 2009 repaving project. Reaction among residents was mixed before the project, but views shifted to strong support after the project helped reduce crashes in the corridor by 67 percent—that’s a full 2/3 reduction! A second road diet was installed on nearby Soapstone Drive in 2011, and that diet resulted in a 65 percent crash reduction. I first heard about road diets when I was mayor of Charlotte, North Carolina. They’ve become popular features there, and FHWA has singled them out as one of nine proven safety countermeasures for cutting fatalities and serious injuries on America’s roadways. Better roads, more options, and safer travel – that’s a diet we can all live with. FABB will have our monthly meeting/holiday party starting at 7:30 p.m. at Patrick Henry Library in Vienna on Wednesday (Dec. 17th). Everyone is welcome to attend. Some of us are bringing snacks and drinks; if you plan to attend, please let us know. Also on Wednesday bikes@vienna is celebrating the holidays from 5-7 p.m. The shop is located almost across the street from Patrick Henry Library so you could attend the bikes@vienna event and then join us at the FABB party. 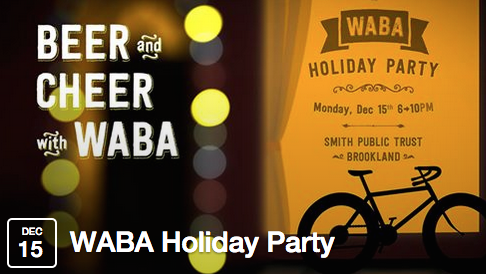 All WABA members can start your week off right by attending the WABA Holiday Party. The event will be held on Monday (Dec. 15) at Smith Public Trust, a restaurant near Catholic University in DC, from 6-10 p.m. The party is for WABA members only. If you're not a member, you could join today. At their meeting on Monday, Dec. 15 at 8pm the Vienna Town Council will vote on adding a climbing lane to Marshall Road from near Nutley St to the top of the incline to the east. 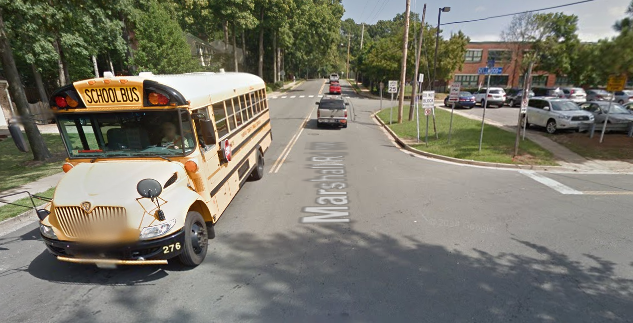 The Transportation Safety Commission recently asked staff to “conduct a study and recommend potential traffic calming and pedestrian safety improvements to Marshall Road SW.” Marshall Road extends from Nutley St, past Marshall Road Elementary School, northwest to Hillcrest Dr. As part of the recommendations to calm the street, a bike lane on the uphill section of road, referred to as a climbing lane, is being proposed. Please consider emailing your support or comments to council@viennava.gov or if possible attend the meeting Monday night that begins at 8 pm. The Council chambers are on the second floor of Town Hall. See details about the Marshall Road project and info about the council meeting. Jones Branch Connector Project meeting - Fairfax County will present plans for a future bridge over the Beltway in Tysons, the Jones Branch Connector Project. 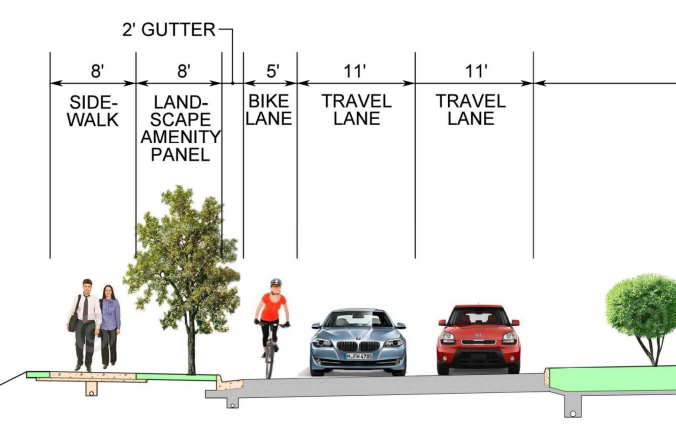 The new bridge would extend from Route 123 near the McLean Metrorail station across the Beltway to Jones Branch Dr. Bike lanes are currently included in the plans for the road and bridge. The meeting will be held at Spring Hill Elementary School, 8201 Lewinsville Road, McLean, from 6:30-8:30 p.m. with a formal presentation at 7:15 p.m. Please consider attending and supporting bike access on the bridge. Route 28 Safety Study Meeting - VDOT is holding a public meeting "regarding the development of a traffic and operational safety study to identify short-term recommendations to improve traffic operations on Route 28 (Centerville Road) from South of I-66 to Liberia Ave." The Route 28 Corridor Safety and Operations Study meeting is on Wednesday, December 10, at Centreville Elementary School, 14330 Green Trails Blvd., Centreville from 6:30-8:30 p.m. A brief presentation will begin at 7:30 p.m. Better bike access across and along Route 28 should be included in this study. VDOT is holding a public meeting "regarding the development of a traffic and operational safety study to identify short-term recommendations to improve traffic operations on Route 28 (Centerville Road) from South of I-66 to Liberia Ave."
The Route 28 Corridor Safety and Operations Study meeting is on Wednesday, December 10, at Centreville Elementary School, 14330 Green Trails Blvd., Centreville from 6:30-8:30 p.m. A brief presentation will begin at 7:30 p.m. 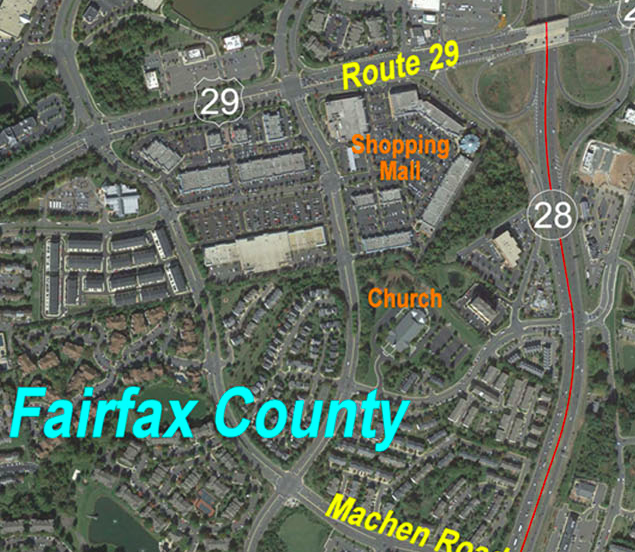 Even though the Countywide Trails Plan designates bike facilities along Route 28 there is currently no bike access along most sections of the road in Fairfax County. Cyclists are encouraged to attend this meeting and speak out in support of bike access along and across Route 28. There are several locations where Route 28 is a major barrier for bicycle and pedestrian access. In 2009 VDOT converted Lawyers Road from four lanes normal travel lanes to two normal lanes, two bike lanes, and a center turn lane, known as a "road diet." The main goal of the project was to reduce motor vehicle crashes. It also created a safer road for all road users. The project was the first in Virginia and has been a huge success, reducing crashes by over 70%. The Federal Highway Administration recently published the "Road Diet Informational Guide" that users Lawyers Road as the case study. VDOT staff provided input to the guide's authors based on their experience with road diets in Virginia. In 2011 a second road diet in Reston converted Soapstone Drive from four lanes to two lanes and bike lanes, providing good bike access to the new Wiehle-Reston East Silver Line station. See our coverage of the Lawyers Road and Soapstone Drive projects. We are fortunate to have some very forward thinking engineers in the Northern Virginia District of VDOT who are willing to experiment with new road treatments that make some of our roads safer for everyone. Fairfax County will present plans for a future bridge over the Beltway in Tysons, the Jones Branch Connector Project. The new bridge would extend from Route 123 near the McLean Metrorail station across the Beltway to Jones Branch Dr. Bike lanes are currently included in the plans for the road and bridge. Next Wednesday, December 10, the county will hold a public meeting to present the plans and get feedback from the public. Cyclists are encouraged to attend the meeting and speak out in support of bike access on the bridge. The meeting will be held at Spring Hill Elementary School, 8201 Lewinsville Road, McLean, from 6:30-8:30 p.m. with a formal presentation at 7:15 p.m. In related news, the county hopes to create bike lanes on Jones Branch Dr when the road is repaved next summer. The Fairfax County Board of Supervisors adopted their Legislative Program at their meeting yesterday. As has been the case for the past several years, the program included a request that would require motorists to stop for pedestrians and bicyclists in crosswalks. Currently motorists are only required to yield, which means they "shall change their course, slow down, or stop if necessary." The Board doesn't think much of the idea of devolution which would require counties to build and maintain roads that are currently the responsibility of VDOT. Delegate Ken Plum recently asked if I would appear on his cable TV show Virginia Report to discuss the recently adopted Fairfax County Bicycle Master Plan. Reston Impact November 2014 from Comcast Channel 28 on Vimeo. To add to your list of behavior that endangers bicyclists and pedestrians, turning right on red lights is very high on my list. When cruising through a stop sign, motorists are looking left and not looking for pedestrians or cyclists attempting to cross from the right, who likely have the right of way. I think it’s become habitual for most DC area motorists, including police. Like most cyclists and pedestrian, I am also a motorist. Having heard criticisms about bad bicyclist behavior for many years, I am now a better motorist. However, I also am more aware of other motorist’s behavior, including noting the above infractions by motorists at nearly every intersection. Now when I drive I stop and look right before turning left and I try to go the speed LIMIT; almost no other motorists drive at or below the speed limit. When asked about it almost every motorist I’ve talked to thinks it’s OK to drive above the limit. My nomination for the most widely abused speed limit is the 35mph limit as one approaches the main Dulles Toll Road booth in Tysons from the west. I’ve tried going 35 but am almost rear-ended when I do. The next time you pass through an intersection with a STOP sign or traffic signal, count how many times motorists run red lights when turning right on red or fail to stop at the STOP sign. One of the best reasons to ride in the road is that cyclists become a part of traffic and motorists are more likely to see you. However, there are many times when I and other cyclists choose to ride on trails parallel to major roads. One example is the trail on Wiehle Ave in Reston near the new Wiehle-Reston East Metrorail station. In the video below, a cyclist or pedestrian would be approaching on the trail to the right where these motorists are turning right on red without stopping, especially at around 12 seconds into the video.